Say goodbye to annoying, hard-to-apply, streaky neons. 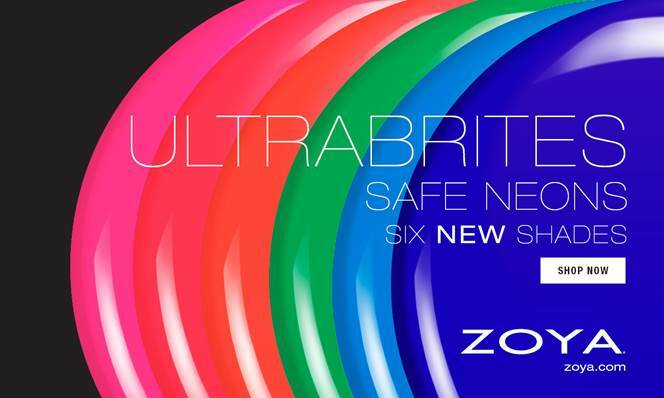 In keeping with our brand philosophy to be The HEALTHY NEW COLOR of FASHION, revolutionary new Zoya ULTRABRITES formula delivers the brightest neons using the latest environmentally and cosmetically approved pigments in a highly stable formula. Cana – bright neon fuchsia cream. Bisca – hot pink neon cream. Evergreen – electric green neon cream. Juvia – summery teal neon cream. Mirajane – classic navy neon cream.